Employee Handbooks are an important part of your hiring package. They include necessary legal statements, outline employment expectations, relate your corporate vision, and define benefit packages. Our template can help you easily create this important human resource document. Your company is growing, and you are starting to add employees. Your current handbook is outdated, and you need a new version. You want to ensure your managers and their teams follow consistent policies. Your company needs an added layer of legal protection. A comprehensive, yet easy-to-understand Employee Manual is valuable to you and your employees. It gives everyone a document to refer to when company policy questions arise. Plus, they include the legal language you need to protect your company and employees. Employee Handbooks not only outline your employment policies, but they also are a way of welcoming a new employee to the company and showcasing your company culture. It is best to start off a new employment relationship with clear expectations and well-communicated policies. Legal protection. 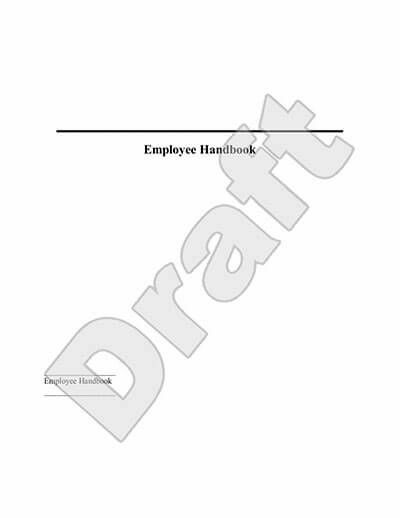 Employee Handbooks describe the employment relationship (at-will most often), time off policies, reasons for possible termination, harassment and discrimination policies and complaint procedures. Highlights benefits packages. You can relate what your employee can expect you to offer them in terms of health insurance, 401K plans, paid time off, holiday pay, disability insurance and more. You can also explain when benefits take effect. Saves time. While you'll want to spend some time welcoming your new employee to the company and explaining to them your expectations, the handbook explains much more and gives them something to refer to should they have questions. Helps unify your managers. A comprehensive Employee Manual is also a good reference for your managers. Using it, they can more clearly explain company rules like vacation policies, plus all the managers will be able refer to the same information for consistency across departments. Defines expectations. When you are talking with your new employee you likely don't want to focus on "what they can't do" the first few days. To start communications in a positive tone, you can use the Employee Handbook to cover restrictive topics such as hygiene and dress codes, social media and computer use restrictions, drug and alcohol policies, and complaint procedures. We are not going to sugar-coat it, writing an Employee Handbook is not an easy task especially if you do not have a Human Resource team to create it for you. Employee Manuals are long and include a large volume of information about your company culture, performance expectations, dress codes, mobile phone policies, legal statements and much more. That is why using our template is significantly helpful since it can guide you through the most common handbook inclusions one-by-one. It takes a bit of time to fill out this form, but it is much faster than it would be if you were starting with a blank page. Plus, it includes most of the legal language that your state likely requires. Some companies offer full-time benefits to those who work over 35 hours per week, others may require 40 hours. And some even offer benefits to all employees even if they do not work full-time. You'll need to decide what you consider full-time and what benefits will be offered to part-time and full-time employees. Also, when will benefits begin? After 30 days or after six months? Is there a probationary period? Will employees need to sign a Nondisclosure Agreement? Nondisclosure Agreements help you protect your proprietary information. We've included a section for a nondisclosure in our template if you need one. You can use this agreement to protect your business information such as marketing strategies, client information, unique processes, proprietary software or equipment, and more. You'll want to define what action might cause an employee to lose their job. How many days can they miss before they lose their employment? What happens if they don't call in? Would theft be a firing offense? What about harassment or objectionable language? Are periodic drug tests required? Your employees should know what may cause them to lose their job. Do you have a dress code? Are company smocks, t-shirts or uniforms required? What are your hygiene expectations? Does the company pay for dry cleaning or launder uniforms? Is there a cost to the employee for replacing required clothing? Some companies even choose to attach images of appropriate work attire as examples. Will you be providing computers, laptops, tablets or mobile phones for your employees? Do you want to limit personal use on company-owned devices? Do you want to limit personal mobile phone use to breaks and lunch periods? Do you want to restrict employees from using your company email service for personal use? You can also define how you want company related social media accounts to be used. You'll need to define sick, personal and vacation time off policies. Will sick and personal time off (PTO) be accrued separately or will PTO be lumped together and be used for sick or personal time? What holidays are paid days off? What about funeral time or jury duty? What about maternity or paternity leave? How much notice do they need to provide when requesting time off? Required legal statements about Equal Opportunity Employment, the American with Disabilities Act, unemployment and workmen's compensation, employment of minors or relatives, personal privacy, immigration law, harassment and discrimination, safety, and Family Medical Leave information is all included in the template. To ensure that you are complying with local and state employment laws, you may benefit from having an employment lawyer review your handbook. Keep it short. If you can, it should only be a few sentences long. Most employees are not going to read much more than a short paragraph. Ask for help. Your current employees and business partners may be able to help you define the vision for the company. Test it. Ask business associates, employees and even clients if they can easily understand what you are trying to say about your company. Does your company reflect that vision from the outside? Be specific. Saying that your company "is striving to be the best in the world" is a vague statement. Try to write a statement people can visualize and aim for. What if I need to change my Employment Handbook? Company policies change often and that's okay. 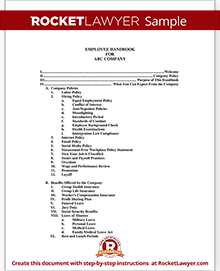 This document includes a disclaimer about how employees are responsible for knowing policy changes and that the Employee Handbook is not an employment contract. To fulfil your part, you should do your best to communicate company policy changes. You should also inform your employees about new employment laws as they go into effect. You do not need to print new handbooks every time a change is made. But if you can, you should update your online version to reflect the changes and make sure your employees have access to it. We provide numerous business forms and templates for employers. If you need other documents or HR information, see our Essential Employer Documents and Human Resources Guide. Our step-by-step interview process makes creating a printable Employee Handbook easy.